With love and sorrow we share the passing of our beloved Mother, Grandmother and Great Grandmother, Mary Edith Rogers Layton. Born on a farm on Lewis Mountain to Henry and Minnie (Dobson) Rogers, she enjoyed pleasant days there and later in Mannhurst with her parents and siblings Pearl, Norman and Everett. She was last among them to cherish the memories of those days. As well as being a loving and dedicated mother to her daughter Barbara (Stephen) Carter, she worked diligently with the T. Eaton Company and at the Jordan Memorial Home. 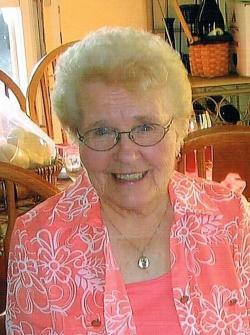 She had been a member of the Ladies Auxiliary of the Petitcodiac Legion and enjoyed many a card game there, as well the ones shared with her friends at Kodiac Place. Her granddaughter Denise (Jim) Douthwright and great granddaughters Sarah (Nick Grandy) and Emily Rouse will be forever grateful for the years shared and the generosity we received from her passion for shopping. The true Matriarch of our small family, her love and guidance will never be forgotten and will carry forward with us in the days to come. Although she had outlasted many of her family and closest friends in this life, she leaves several nieces, nephews and friends from Kodiac Place with warm memories as well. A Celebration of Mary’s Life will be held from Armstrong’s Funeral Chapel, 33 Russell St, Petitcodiac on Friday, March 29, 2019 at 2 pm with Mary's niece Rev. Carol Mullin and her nephew Pastor Vincent Burgess officiating. Interment will be held in the spring. If desired, memorials to The Glades Cemetery or to the charity of your choice would be appreciated by the family.